Just when you thought David Beckham couldn’t possibly have any more room on his arms for tattoos, the soccer star has gotten yet another hand tattoo, which he showed off while navigating Los Angeles’ LAX airport on May 31, with his family in tow. David Beckham’s tattoo reads “Lead with love” in a curly script font and is inked in black on the back of his left hand, just below the “Love” tattoo he had done back in 2011. 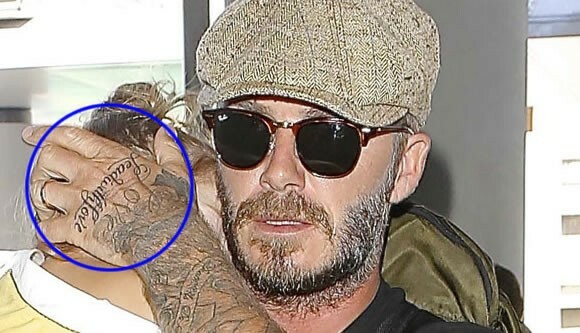 There have been rumors of new David Beckham tattoos circulating over the past few months, but this hand tattoo is the first time we know for sure the 39-year-old has gone under the needle since adding a “Victoria” and swallow tat to his opposite hand in September 2013. The Beckham family was apparently headed to the Serpentine Gallery in London to promote David’s upcoming documentary David Beckham: Into the Unknown, and it was as the proud father cradled a sleepy Harper’s head on his shoulder while walking through LAX airport that he revealed the new “Lead with love” tattoo on his hand. Although David hasn’t spoken in public about the meaning behind his new hand tattoo, it’s possible that the ink is meant to inspire him as he works to establish a new soccer team in Miami. It may also represent the ideals he wishes to follow as a parent to his four kids Brooklyn, Romeo, Cruz and Harper – being a positive role model who always leads with love, kindness and fairness. It’s true that most of David Beckham’s tattoos were inspired by his family, namely the 14+ tattoos he has dedicated to his wife, Victoria, so it’s possible that this hand tattoo has to do with his loved ones as well. Also, the new “Lead with love” ink isn’t the first of David Beckham’s tattoos to serve an inspirational purpose for the international soccer legend. He also has a Latin tattoo meaning “spiritual perfection” on his arm, a Chinese proverb on his ribcage reading “Death and life have determined appointments. Riches and honor depend upon heaven,” and a Hebrew arm tattoo that means “I am my beloved’s and my beloved is mine.” David’s new “Lead with love” hand tattoo was inked as the 39-year-old prepares for the airing of his new documentary next week. I Love David Beckham Tattoo Designs. Really very thanks for sharing david beckham new tattoo information. Tenho duas tattoo dele, ele é que me da inspiração.